Our Trader Spotlight shines on Lost on France Studio this month. Lucy Suddaby-Smith makes jewellery filled with nature which means each piece is unique. 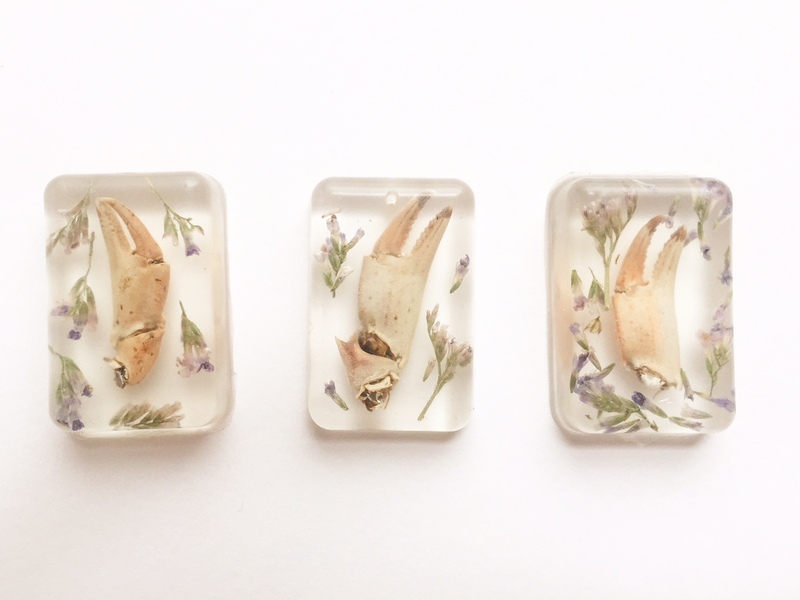 She encases flowers and plants in eco resin and then makes the gems into jewellery creating wearable mementos of nature. She sells on Etsy and trades at the Harbourside Market and is also available for commissions. Tell us how and why you started Lost in France Studio? Since I was a child I have always pressed flowers and when I was travelling around Europe I collected lots of flowers which I wanted to preserve to remind me of the wonderful memories I had made. When I was given Mimosa at International Women’s Day whilst I was staying in a dream-like mountain top village named Montefegatesi in Italy, that was the turning point and I knew I wanted to preserve the memory. A couple of years ago I moved to Berlin and brought along my flower press and some resin. The first day I arrived (sadly the same day we learnt we were to leave the EU) I encased flowers in resin and since then I have been utterly obsessed. I come from a background of illustration, animation and textiles and have always been on the search for a material I could experiment with and I am so happy I discovered resin. I have been building Lost in France Studio since last March 2017 and it has brought so much wonder of many aspects into my life. . I am always finding flowers I have picked in notebooks, bags and pockets, flowers have taken over my life! Describe the making process, from conception to delivery? First of all I pick the flowers and then press them in either my flower press or books. I pour the resin in layers into moulds and once they have fully cured I sand them, drill them, polish them and then finally add the jewellery findings. Ooo that’s a difficult question as each piece is completely different due to the nature of organics, but I would have to say I am currently into the pieces I make which are shell shaped. I have a necklace I made for myself which holds memory seed and sea lavender, two different flowers from two different best friends, sentiment supreme. I love ladybirds and I enjoy very much incorporating them into pieces. I shall say here that all the bugs I use have ended their lives naturally. I also love doing commissions as that means I can create something of meaning and sentiment for others. The earth! Hehe. Everything else I try to make or use is handmade or sourced local to the best of my ability. Are there any other designers or makers who inspire you? I really love classical paintings of the Renaissance and Pre-Raphaelite eras and the works of John William Waterhouse, Gustav Klimt and Tamara de Lempicker. I am very grateful to be surrounded by lots of talented creative people, my favourite illustrators to name a few are Holly Maguire, Omi Hermitage, Akhran Girmay, Solhiart and Natalie from Pencil Pusher. Roo Bannister and Etta Collective are two jewellery makers I am currently really inspired by : their designs, packaging through to their concept are fantastic. My friend Aisha who goes by the name of Chaouche has just released her first music album which I have really enjoyed when creating. Tell us the most important thing you’ve learnt since starting your creative business? My gosh, I have learnt so much! The main thing I have learnt is really just to do it and that nothing needs to be instantaneously perfect, it’s about the build. It’s fab fab fab to see how people are becoming more drawn to small businesses and local independant makers rather than the mass produced mainstream. Lost in France Studio is still quite a baby so I am always learning and developing but I would love to start incorporating my illustrations and textile work too. I want my business to be as ethical and sustainable as possible so my first step has been to use eco resin instead of epoxy resin. Small steps all in good time. Follow Lost in France studio on Facebook and Instagram for all the latest updates. You can also purchase her beautiful wares over at her Etsy shop.